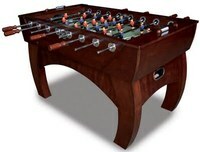 The AMF Coliseum table is one of the high quality tables made by the Sportcraft manufacturer. 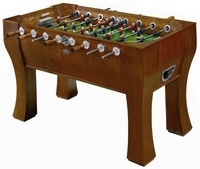 This table has a furniture-like aesthetic appeal with traditional foosball men. 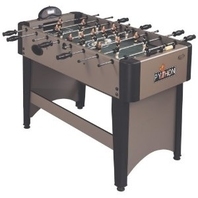 The AMF Coliseum table is made with some high-end parts, but falls short when analyzing the details of the table against others in this price range. The foosball men are counterbalanced, but the more traditional style has a rounded toe that makes it difficult to pin the ball to the table to complete shots like the snake shot. 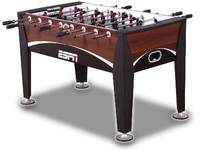 The wooden handles are also a nice feature on the Colisem, yet they are finished with a veneer that makes them more slippery which can hurt shot performance. 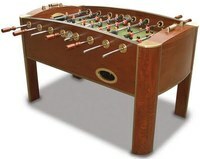 The rods are also slow and sluggish compared to the Tornado foosball tables that we recommend. 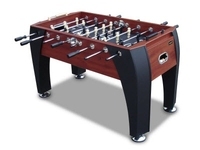 This foosball table is priced at around $530 US.